The former Governor of North Cotabato, who is currently a political and sports columnist shared the important information regarding to the 'Super Evil' operations that might happen today, May 7, 2016. Manny Piñol confirmed the report that there will be a 'cloud-seeding' operations over Metro Manila. Manny said, " Just how evil could people get and think when power and money are at stake? Super evil, that's how." Just how evil could people get and think when power and money are at stake? 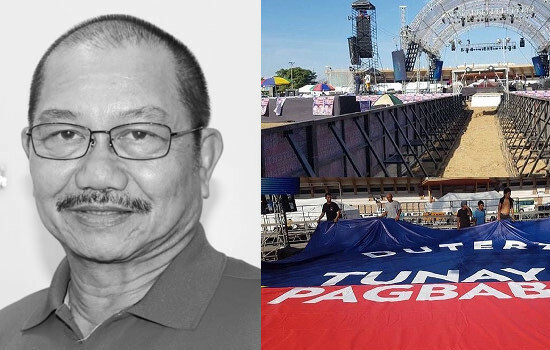 After exhausting all means, both legal and illegal, to stop Rody Duterte from becoming the next President, and catastrophically failing, evil minds in Malacañang are now planning to mess with Mother Nature by inducing rain tomorrow when tens of thousands are expected to gather in the Luneta for Duterte's Miting de Avance. Sources in Malacañang Palace (yes, there are still good men in that snake pit) filtered out the information that a cabal of evil men are now planning to conduct cloud seeding operations tonight to enduce rain in the Metro Manila area. Why am I sharing this information with you and the public? It is being leaked so that whoever is hatching this evil plan would know that we know. This is no different than the Great Drug Raid which they planned for Davao City in December last year to destroy Duterte's image as an anti-drug crusader and the planned bombing of the press conference which Senator Antonio Trillanes was supposed to hold a few days ago. Earlier, they launched a massive black propaganda against Duterte using Trillanes to allege that the simple living Davao City Mayor was keeping billions in hidden accounts, an allegation which was effectively disproven. Liberal Party (LP) administration candidate joined he demolition job by claiming that Duterte kept ill-gotten wealth in his $ accounts. It was another demolition job which went pfft! after Duterte showed that he only had $5,000 in the bank. Then, starting last night, Trillanes, supported by the administration and pro-Roxas ABS-CBN aired negative TV ads attacking Duterte by using children. Again the negative ad has backfired. Now, they want to tamper with Mother Nature to cause rains in Metro Manila even when the Weaterman says it is going to be Sunny tomorrow. This is the same group which is threatening Filipinos that Duterte would be a dictator when he becomes President. They are the real dictators as they even dictate the clouds when to drop as rain. So, if it rains tomorrow, you know who caused it. But these evil minds do not know that the Filipino people have decided to support Duterte and hitch their stars on his promised Change. They are willing to do everything to make him him - Come Hell or High Water! Last Wednesday, May 4, the wide grassed area in Quirino granstand in Luneta Park was overturned by a backhoe. And it was a confirmed report by Duterte's supporters over their social media accounts then shared the photos in all DDS Facebook group. According to National Park and Development Committee (NPDC), they don't know that there will be an event on May 7, and that was the schedule of their operations. Is this coincidence? or it was really a planned sabotage for the meeting de avance of Mayor Duterte? Share your thoughts below. Comments or suggestions about "Manny Piñol: Evil Minds plan 'CLOUD SEEDING' over Metro Manila " is important to us, you may share it by using the comment box below.